Editor's note: Two days after Superstorm Sandy roared into the Northeast, ravaged cities are working on cleaning up from floods, wind and fire. Millions remain without power. The storm has left at least 122 dead from Haiti to Canada. Here is the full story and below is the latest news as we learn it. [Updated 1:40 a.m.] About 4.9 million customers remain without power in 15 states and the District of Columbia today, a CNN tally shows. That number dropped by about 600,000 in six hours. [Updated 10:32 p.m.] New York Gov. Andrew Cuomo declares a transportation emergency Wednesday and authorizes the Department of Transportation to waive fares through Friday as an inducement to get people to take mass transit. [Updated 8:52 p.m.] The following video shows some of the devastation in and around Seaside Heights, New Jersey, a city known in part for hosting several seasons of MTV's "Jersey Shore." A roller coaster is in the ocean, and house after house is destroyed. The mayor of the barrier island community says residents will be shocked by the destruction when they're able to get back there. [Updated 8:33 p.m.] The number of U.S. deaths believed to be linked to Sandy has risen to at least 56, according to a CNN tally. That's 28 in New York; nine in Pennsylvania; six in New Jersey; five in West Virginia; two in Maryland; two in Connecticut; two in Virginia; one in North Carolina; and one on the HMS Bounty in the Atlantic. One death in Canada and 67 in the Caribbean also are attributed to Sandy. So, CNN's total death toll for Sandy is at least 124. [Updated 7:33 p.m.] About 5.5 million customers remain without power in 15 states and the District of Columbia, according to a CNN tally. That number dropped by about 400,000 in six hours. [Updated 7:08 p.m.] Some details on why New York's Bellevue Hospital - one of the nation's largest hospitals - is being evacuated: The building lost regular electricity service during the storm, and backup generators have been providing power since then. 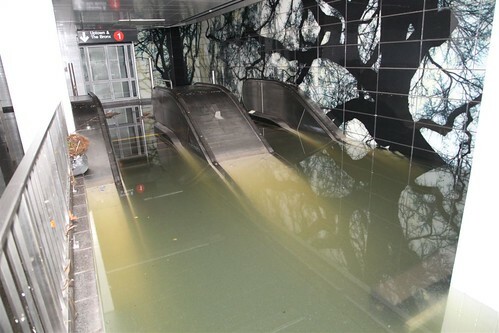 But people have been having to carry fuel up 13 flights of stairs because the fuel pumps that normally supply the generators are in the basement, and the basement is flooded, a source told CNN. Officials decided Wednesday that the fuel pumps aren't salvageable. "What they realize is that their emergency generators are not continuing to work well," said Dr. Sanjay Gupta, CNN's chief medical correspondent, who was reporting from outside the hospital Wednesday. So, rather than continuing under these conditions, with regular power service not expected soon, officials decided to evacuate the remaining 700 patients. The most critically ill patients were evacuated earlier. The evacuation process could take a couple days. [Updated 6:35 p.m.] Metro Transit Authority chairman Joe Lhota talks about what it will take to get the New York City subway system running. Parts of it - north of Manhattan's 34th Street - are expected to be running Thursday. [Updated 6:11 p.m.] At least 14 people have died on the New York City's Staten Island as a result of the storm, borough President James P. Molinaro said. It's unclear how this affects the death toll in New York state, where we know at least 26 deaths have been reported. "It's like a tsunami hit us, and this is the aftermath," Molinaro told CNN. Molinaro said dozens of houses on Staten Island have been destroyed, thanks in part to storm surges of more than 13 feet. About 114,000 customers - two-thirds of the borough - are without power on Staten Island, he said. [Updated 6:06 p.m.] U.S. Rep. Bob Turner, R-New York, says the fire that destroyed his house and more than 100 others during the storm Tuesday morning in the Breezy Point neighborhood was heartbreaking. He says he left his home while the fire was burning in the area, but before it got to his house. Because roads were blocked by floodwater, it took about two hours for firefighters to reach the homes, he said. “There was no way the engines could get through what was, at one point, 5 feet of water in the road,” Turner, a resident of the neighborhood for 32 years, told CNN's Wolf Blitzer. He said he and some neighbors hope to rebuild their homes. [Updated 5:49 p.m.] New York's LaGuardia Airport will open Thursday at 7 a.m., and airlines will be operating limited flight schedules, the Port Authority of New York and New Jersey announced on their website. The airport has been closed because of significant flooding and damage relating to Sandy. Two other New York-area airports - John F. Kennedy and Newark International Airport - reopened Wednesday with limited service. [Updated 5:32 p.m.] In a rare example of wireless provider collaboration, AT&T and T-Mobile have agreed to share networks in New York and New Jersey, allowing customers to use whichever network gets coverage in their areas, CNN's Heather Kelly reports. The move could make it easier for storm victims there to get cell phone reception. Making calls across the Northeast has been difficult following Sandy, and New York and New Jersey seem to be the hardest hit. According to the Federal Communication Commission, about a quarter of cell phone towers in the 10 states were knocked out by the storm. [Updated 5:24 p.m.] CNN's Kevin Liptak has more on the tour that President Barack Obama and New Jersey Gov. Chris Christie made Wednesday of the storm-damaged areas of New Jersey. 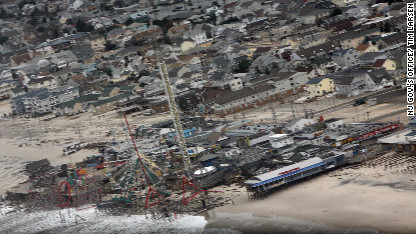 The helicopter tour took the president and the governor over cleanup efforts in Atlantic City and surrounding towns, including Seaside Heights, where a large pier that previously housed a roller coaster has been submerged in seawater. Later, Obama and Christie toured a makeshift shelter in the Brigantine Beach Community Center, northeast of Atlantic City, where 200 spent the night during the storm's peak on Monday night. [Updated 4:54 p.m.] President Barack Obama, addressing reporters in Brigantine, New Jersey, after touring damaged areas of the state with Gov. Chris Christie, said he's directed his staff members and people in his administration to tolerate no red tape or bureaucratic excuses when it comes to getting storm victims the help they need. "We will not quit until this is done," Obama said, adding that he's instructed his people to return the calls of officials in storm-damaged states within 15 minutes. "If they need something, we figure out a way to say yes," Obama said. Obama said New Jersey, New York, West Virginia and Connecticut "are really bearing the brunt of this incredible storm." Power companies from as far away as California have pledged to send equipment crews, he said. [Updated 4:41 p.m.] President Barack Obama and New Jersey Gov. Chris Christie are addressing reporters in Brigantine, New Jersey, after touring damaged areas together and speaking with people in shelters. "I cannot thank the president enough for his personal concern and compassion for our state and the people of our state," Christie said. "[Engineers] have determined that the ties that bind the crane tower to the building are secure," Bloomberg said. "There was enormous torque when the crane fell over, and the fact that those connectors have withstood the pressure just testifies to how well they were put in and how stable that tower is. "The next step is going to be to determine some steps as to how to begin shrinking the zone around the frozen area as we eventually get around to - probably tomorrow or the next day - tying the boom to the building so that they can then work around the top of it, and they’ll have to construct another crane on top of it in order to take down this one. And that can take weeks, but once the boom is secured we should be able to minimize any destruction on the street below. But certainly that street is not going to be fully reopened until some time this weekend at the earliest." [Updated 4:02 p.m.] Engineers have concluded that a partially collapsed crane that has been dangling for days off a under-construction, high-rise apartment building in midtown Manhattan is secure, New York Mayor Michael Bloomberg says. However, the street below won't be open until at least this weekend, he said. The crane's arm, damaged by Sandy, has been dangling 90 stories above New York City. Police have cordoned off the area around the base of the One57 building on West 57th Street. [Updated 3:55 p.m.] The minimum number of U.S. deaths believed to be related to Superstorm Sandy has risen to 54, based on reports from officials in affected states. The overall minimum death toll, which includes a death in Canada and 67 in the Caribbean, stands at 122. The U.S. deaths include 26 in New York; nine in Pennsylvania; six in New Jersey; five in West Virginia; two in Maryland; two in Connecticut; two in Virginia; one in North Carolina; and one on the HMS Bounty. [Updated 3:45 p.m.] The New York marathon will happen as scheduled on Sunday, despite the damage from Sandy, Mayor Michael Bloomberg said. He added that New York public schools will remain closed Thursday and Friday. See the 3:17 p.m. update below for what's going on with transportation. [Updated 3:17 p.m.] We reported earlier that limited commuter train service would resume in New York City on Wednesday afternoon - and now Grand Central Terminal has reopened, the New York Metropolitan Transportation Authority says. A recap of other New York City-related transportation information: Limited subway service is expected to start on Thursday. New York buses were operating at full service Wednesday. New Jersey Transit rail and light rail will remain suspended until further notice. Bus service also is also suspended, with the exception of limited service in Camden County. Two New York-area airports - John F. Kennedy and Newark International Airport - reopened Wednesday with limited service. New York's LaGuardia Airport will remain closed Wednesday because of significant damage there. The Port Authority of New York and New Jersey says it's waiting for electrical power to be restored to begin pumping out the Holland Tunnel. Three of seven East River tunnels have been pumped and are free of water. [Updated 3:08 p.m.] About 6,300 people are in 76 evacuation shelters in New York City, Mayor Michael Bloomberg said Wednesday. In coming days, officials will consolidate some of the shelters, he said. [Updated 2:50 p.m.] President Barack Obama and New Jersey Gov. Chris Christie met in Atlantic City, New Jersey, earlier this afternoon ahead of an aerial tour of damage caused by Sandy. Sandy came ashore late Monday in southern New Jersey, wiping out houses, pushing sand four blocks inland and leaving people stranded. [Updated 2:41 p.m.] An update to the evacuation at New York City's Bellevue Hospital: The number of remaining patients who will be evacuated is about 700, and the process could take two days, a source familiar with the evacuation plan told CNN. Many critically ill patients were evacuated earlier. The hospital's generators are on the 13th floor, but the pumps that supply oil to the generators are in the basement under 8 feet of water, the source said. [Updated 2:12 p.m.] New York City's Bellevue Hospital will evacuate the remaining 500 patients inside, according to an e-mail from a hospital group sent to New York-area hospitals. Many critically ill patients were already evacuated, but about 500 remained. Ambulances are lined up outside the hospital in preparation, CNN's Dr. Sanjay Gupta reports. [Updated 1:43 p.m.] The city of Long Beach, New York, says residents should evacuate if they have not already done so and not return until services such as water, sewer and power have been restored. Buses will go through neighborhoods to pick up residents and take them to shelters, according to the city's Facebook page. A curfew will be in effect from 7 p.m. Wednesday to 6 a.m. Thursday. [Updated 1:27 p.m.] Two more storm-related deaths have been confirmed in Pennsylvania, bringing the U.S. death toll to 50. A total of 118 people have died from the storm, including 67 in the Caribbean and one in Canada. [Updated 1:24 p.m.] About 5.9 million customers are without power in 15 states and the District of Columbia, according to numbers compiled by CNN from local power providers. [Updated 1:21 p.m.] Coastal towns say damage from Superstorm Sandy was much worse than what Hurricane Irene did last year, and cleanup will cost multiple millions of dollars, CNNMoney reports. [Updated 1:11 p.m.] President Barack Obama has arrived in New Jersey to tour the storm-damaged area, according to reporters traveling with the president. [Updated 1:02 p.m.] Four more storm-related deaths have been reported in West Virginia; 48 deaths are now reported in the U.S. 116 people have died in all, from the Caribbean to Canada. [Updated 12:52 p.m.] The death toll from Superstorm Sandy in New York has risen to 26, Gov. Andrew Cuomo said Wednesday. [Updated 12:47 p.m.] New York expects the federal government to cover the vast majority - or potentially all - of emergency response costs for Superstorm Sandy, Gov. Andrew Cuomo said Wednesday. "We expect the federal government to pick up the lion's share of those costs as they did with Hurricane Irene, as they normally do," he said. Meanwhile, the cost to the private sector cannot yet be calculated, but will be in the billions of dollars, he said. [Updated 12:23 p.m.] Limited commuter rail service on Metro North and the Long Island Rail Road will begin at 2 p.m. Wednesday, and limited New York City subway service will begin Thursday, New York Gov. Andrew Cuomo said. There will be no service for now in Manhattan below 34th Street. 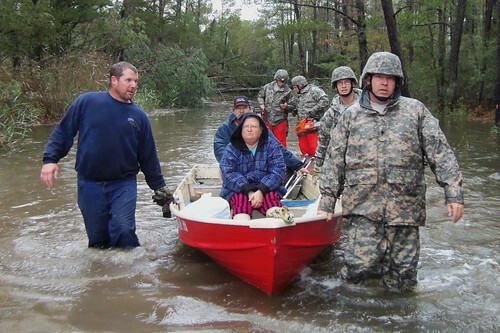 [Updated 12:15 p.m.] Virginia National Guard soldiers used boats to help residents of Mears, Virginia, who were stranded by high water on Tuesday. [Updated 11:50 a.m.] New Jersey is putting off Halloween. Gov. Chris Christie signed an executive order today postponing celebrations until Monday. “I’ve taken this action to minimize additional risks to lives and the public safety as we begin the process of rebuilding and recovering from Hurricane Sandy," he said, calling the postponement "a commonsense and necessary step." [Updated 11:21 a.m. ET] The U.S. Navy is moving three amphibious landing ships toward the coastline of New York and New Jersey in case there is a request for their assistance, Navy officials said Wednesday. [Updated 11:20 a.m. ET] A good indication on why it will take awhile to get New York City transportation up and running. [Updated 11:09 a.m. ET] The remnants of Superstorm Sandy are now multiple centers of circulation across the lower Great Lakes region, the National Weather Service says in its 11 a.m. ET advisory. Gale warnings remain in effect for portions of the Great Lakes. There are flood warnings and watches still in effect for northern New England. Areas of the mid-Atlantic states still have flood warnings in effect and well as portions of Great Lakes shorelines. Winter storm warnings and watches remain in effect for the central Appalachians. [Updated 10:46 a.m. ET] JetBlue reports service is gradually returning to airports affected by Sandy. [Updated 10:42 a.m. ET] The U.S. Coast Guard has sent airboats normally used for ice rescues in the Great Lakes area to the East Coast to assist in shallow water rescues. Read the Coast Guard's Wednesday update. [Updated 10:30 a.m. ET] Residents from New York’s other boroughs took a long, cold walk into Manhattan this morning as some businesses reopened but transportation options remained severely limited. "I left my house at 6:45 a.m. and I'm still walking,” Queens resident Elizabeth Gorman told CNN a couple of hours later. “I think it’s faster to walk. It’s crazy here. I don't know what to do, I have to get to work. "It's sort of like the transit strike a few years ago," added the 40-year-old, who was one of thousands walking across the Queensboro Bridge. "Happy Halloween." [Updated 10:12 a.m. ET] More than 19,500 flights have been canceled as a result of Sandy, according to flight tracking site FlightAware.com. More than 7,000 Tuesday flights were canceled, FlightAware figures show. By 9 a.m. Wednesday, more than 2,800 Wednesday flights and more than 480 Thursday flights had been canceled. Read more. [Updated 9:59 a.m. ET] A CNN satellite truck was just what people needed to charge their cellphones in Manhattan. CNN Meteorologist Rob Marciano told us that sat-truck engineer Ken Ryan set out power strips for residents and passersby. “He does it whenever he is in a disaster zone for people to charge their phones," Marciano said. And Ryan’s not alone. He’s following the practice of another truck operator he saw in a hurricane-hit area years ago, and we know our colleague Chris Stewart is doing the same thing in New Jersey. "Even though I'm in a truck, I'm still here on the street where there's no power or lights,” Ryan said. “I can't help with a lot of things, like get the power back up or power up their computer, but I can help them keep their phones charged." [Updated 9:57 a.m. ET] See some of the damage Superstorm Sandy did in Toronto from CNN affiliate CTV. [Updated 9:36 a.m. ET] President Obama will resume campaigning for Tuesday's election on Thursday with stops in Green Bay, Wisconsin; Boulder, Colorado; and Las Vegas, a campaign aide tells CNN. Follow the campaign on the Political Ticker. [Updated 9:34 a.m. ET] U.S. stocks open mixed after being shut down for two days because of Superstorm Sandy. The Dow rises 21 points. Check CNNMoney for market updates. [Updated 9:30 a.m. ET] This is what the Jersey Shore looks like after the hit from Sandy. The photo was provided by the New Jersey governor's office. [Updated 9:18 a.m. ET] The Port Authority of New York and New Jersey says it's waiting for electrical power to be restored to begin pumping out the Holland Tunnel. [Updated 9:04 a.m. ET] Superstorm Sandy’s powerful winds uproot a tree in a Huntington, New York, backyard – as captured in this astounding video. [Updated 8:59 a.m. ET] About 9,000 people across 13 states spent Tuesday night in 171 Red Cross-operated shelters, the agency tells CNN. [Updated 8:56 a.m. ET] New York City police used helicopters to rescue people stranded in flooded homes on Staten Island. [Updated 8:52 a.m. ET] About 25% of cellular towers are damaged in states hit by Superstorm Sandy, the Federal Communications Commission says. The situation could get worse before it gets better, FCC Chairman Julius Genachowski said. On its official Twitter account, the FCC linked to a Wall Street Journal story carrying quotes from Genachowski in a conference call. About a quarter of broadband and cable customers are without service, the story says. A “very small number” of 911 call centers lost power, but calls were rerouted to other centers. The FCC urges people to limit nonemergency phone calls in stricken regions, and to use text and social media to let loved ones know you are OK.
[Updated 8:49 a.m. ET] New York's LaGuardia Airport is still closed this morning, but other airports are resuming limited services. CNN's Richard Quest looks at how Sandy has affected travel. [Updated 8:44 a.m. ET] About 12,000 National Guard personnel are assisting Sandy relief efforts across 13 states and the District of Columbia this morning. This morning, about 12K #NationalGuard members support #Sandy response efforts in CT, DC, DE, MA, ME, MD, NC, NH, NJ, NY, PA, RI, WV & VA.
[Updated 8:27 a.m. ET] A look at the snow from Sandy. Click below. And what the remnants of the storm looked like this morning. [Updated 8:22 a.m. ET] Thirteen people have been arrested in New York, and most of them are charged with looting Tuesday in the wake of Superstorm Sandy, CNN affiliate WABC reports. Much of the looting took place on Coney Island. People ripped their way through damaged storefronts to grab “anything that wasn’t nailed down,” WABC’s Sandra Bookman reports. The precinct that covers the area had been forced to evacuate in the flooding. [Updated 8:04 a.m. ET] The effects of Sandy are still being felt far to the west of where the storm made landfall Monday. The Coast Guard in Milwaukee, Wisconsin, is warning people to stay away from Lake Michigan on Wednesday, with 14- to 18-foot waves expected this morning, according to a report from CNN affiliate WTMJ. [Updated 7:43 a.m. ET] Much of Maine is under a flood watch today. The National Weather Service says the watch is in effect until 2 p.m. An inch or more of rain could come today, on top of what Sandy already brought. [Updated 7:31 a.m. ET] While the storm did billions of dollars in damage in the Northeast, communities much farther south were not spared. An official in Florida's Indian River County says Sandy caused $12 million in beach erosion there. "This is the worst I've seen since the 2004 hurricanes," county coastal engineer James Gray says in a report from CNN affiliate WPTV. Meanwhile, in Kitty Hawk, North Carolina, roads were washed out and torn up by the surf generated by Sandy. "It looked like a big bomb hit and nobody could really get away from it," Kitty Hawk resident Evan Briggman told CNN affiliate WAVY. [Updated 7:17 a.m. ET] A fire is burning on a barrier island in Mantoloking, New Jersey, according to Patrick Cook, a police officer in Brick Township, near the island. Cook said officials could not get to the island to fight the fire or even assess damage as sand and storm debris were blocking access. [Updated 7:09 a.m. ET] The death toll from Superstorm Sandy now stands at 108, with 40 in the United States. [Updated 7:01 a.m. ET] Early Wednesday morning, at least 6.2 million electric customers across the eastern United States were still in the dark from the effects of Superstorm Sandy. [Updated 6:50 a.m. ET] Superstorm Sandy has left at least 39 people dead in the United States, and at least 107 across its entire path, according to figures provided to CNN. Here is the breakdown: New York, 22; New Jersey, 6; Pennsylvania, 3; Maryland, 2; Connecticut, 2; Virginia, 2; West Virginia, 1; HMS Bounty replica, 1. The storm has also caused one death in Canada, and earlier it left 67 dead in the Caribbean. [Posted 6:30 am ET] The remnants of Superstorm Sandy were continuing to weaken over Pennsylvania this morning, the National Hurricane Center said. The storm had "no discernible center of surface circulation," forecasters said in their 5 a.m. ET update. Gale warnings were in effect for portions of the Great Lakes and winter storm warnings and weather advisories remained for portions of six states - Pennsylvania, West Virginia, Maryland, Tennessee, Kentucky and North Carolina. Mayor Bloomberg now endorses President Obama, General Colin Powell endorses President Obama and of course President Bill Clinton who presided over the best economy for America endorses President Obama. And now Gov Christi praising President Obama for immediately responding to help the people of NJ and other states hit by hurricane sandy. Gov Cuomo praising President Obama and FEMA responses to NY. It is obvious to me that this problem is exclusively caused by Obama. Obama, Doomburg- and the little mario coomo jr- all democrats- all ignoring the people in need- worrying about campaigning and marathons. 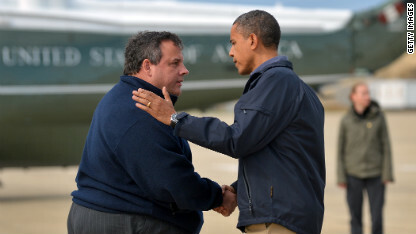 Obama came into NJ for a state sponsored photo op- spending who knows how much his trip that could be used for relief. then Obama jumps on plane spending millions more- flying to Las vegas to campaign and have a good time. On TV people are shown, to be dieing in the street- while Obama ignores them.